An equalizer, or EQ, is a filter that allows you to adjust the volume level of a frequency, or range of frequencies, within an audio signal. In its simplest form, an EQ will let you turn the treble and bass up or down, allowing you to adjust the coloration of, let’s say, your car stereo or an iPod. In recording, equalization is a highly sophisticated art. Good equalization is critical to a good mix. When used correctly, an equalizer can provide the impression of nearness or distance, “fatten” or “thin” a sound, and help blend or provide separation between similar sounds in a mix, allowing both to be heard as intended. It can also be used to adjust a sound system to account for the acoustical response of a room or an outdoor venue. The parametric EQ and semi-parametric EQ are mainstays of recording and live sound because they offer continuous control over their parameters. These types of EQ offer continuous control over the audio signal’s frequency content, which is divided into several bands of frequencies (most commonly three to seven bands). Both parametric and semi-parametric EQs typically provide control of the gain (boost/cut) for each frequency band, the center frequency of the midrange bands, and the cutoff frequency for the low and high bands (see Fig. 1). The difference between fully parametric and semi-parametric EQs typically is that the fully parametric EQ offers continuous control of the bandwidth, which determines the range of frequencies affected, or control over the Q, which is the ratio of the center frequency to the bandwidth (see sidebar “Who or What is Q?”). For most purposes, a Q control accomplishes the same thing as a bandwidth control but they are not identical. The EQ in the Eureka™ is a good example of a fully parametric hardware EQ, offering control of gain, center frequency, and Q for all of its three frequency bands. With more than three bands, you can get even more precise, as with the ProEQ plug-in for Studio One™ (see Fig. 2). In a true semi-parametric EQ, the gain and frequency are adjustable but the Q and bandwidth are fixed at a preset value. A variation on the semi-parametric is the quasi-parametric EQ, which typically provides full frequency and gain adjustment but only two or three Q settings. A good example of the difference can be seen by comparing the fully parametric EQ in the Fat Channel section of the StudioLive™ 24.4.2 digital mixer, which provides continuous Q control, with the quasi-parametric Fat Channel EQ in the StudioLive 16.4.2 or StudioLive 16.0.2 digital mixer, which offers a simple choice of high or low Q settings. We usually call the StudioLive 16.4.2/16.0.2 equalizer a “semi-parametric EQ” because that’s a much more common term and is accurate in a broad sense, but strictly speaking, it’s quasi-parametric. FIG. 2: PreSonus’ ProEQ plug-in for Studio One provides five fully parametric bands plus a high-cut filter and a low-cut filter. The low- and high-frequency bands are shelving filters. A shelving EQ attenuates or boosts frequencies above or below a specified cutoff point. Shelving equalizers come in two different varieties: high-pass and low-pass. Low-pass shelving filters pass all frequencies below a specified cutoff frequency, while attenuating all the frequencies above the cutoff. A high-pass filter does the opposite, passing all frequencies above the specified cutoff frequency while attenuating everything below. Usually, the frequencies beyond the cutoff are rolled off, following a predetermined curve, not cut off sharply, as with a “brickwall” filter. Some multiband parametric EQs offer low and high bands that can be switched to shelving filters. In others, such as the EQ in the Studio Channel, the low and high bands are shelving filters, while the mid band is fully parametric. A graphic EQ typically consists of a bank of slider controls used to boost or cut fixed frequency bands (see Fig. 3). 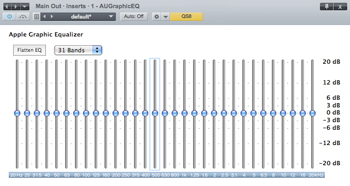 A well-designed graphic EQ creates an output frequency response that corresponds as closely as possible to the curve displayed graphically by the sliders. Designers of analog EQs must carefully choose the bandwidth of the filter and decide how the bandwidth should vary with gain and how the filters are summed or cascaded. In general, narrower bandwidth signifies a more precise EQ. In general, most graphic EQs have between 7 and 31 bands. Professional sound-reinforcement graphic EQs generally have 31 bands, and the center frequency of each band is spaced 1/3 of an octave away from the center frequency of the adjacent bands, so that three bands (three sliders on the front panel) cover a combined bandwidth of one octave. Graphic EQs with half as many bands per octave are generally used when less precision is needed. You will often find this 2/3-octave design on monaural, 15-band (or fewer) graphic EQs in guitar amps, bass amps, and some stompboxes. 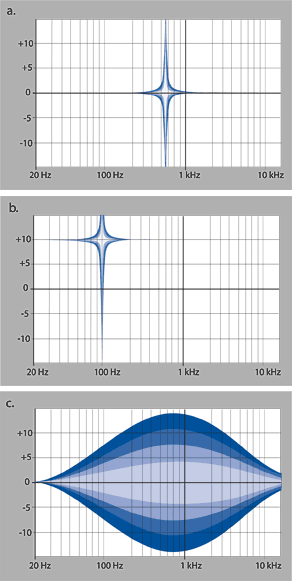 In traditional graphic EQ designs, the center frequency of each band is fixed. FIG. 3: This simple 31-band graphic EQ is an Audio Units plug-in from Apple, inserted in the main bus of PreSonus Studio One. Here, it’s set flat—that is, no frequencies are being boosted or cut. Some high-end digital graphic EQs offer greater precision. This is the approach PreSonus took with the StudioLive mixer: The graphic EQ is a pool of shelving filters from which coefficients like cutoff frequency, bandwidth, and gain are extracted through a process of curve-fitting. The curve entered by the user is first oversampled. The system then works with an internal curve made up of 128 bands to find coefficients for the first shelving filter that, when subtracted from the user’s curve, will produce the flattest possible response: 0 dB. The resulting response is then used to find coefficients for the second shelving filter, using the same optimization process. Coefficients for all available shelving filters are found through a recursive process. Unlike conventional designs, the frequency and bandwidth of the “bands” depends on the curve entered by the user. This allows for much tighter matching of that curve. Because of this innovative design, the curve fitting-process is capable of very steep transitions, and unlike conventional, analog graphic EQs, what you see is what you get. With a carefully drawn, smooth curve, the StudioLive EQ will have almost no frequency ripple. Sub-Bass (16 Hz to 60 Hz). These very low bass frequencies are felt, rather than heard, as with freeway rumbling or an earthquake. These frequencies give your mix a sense of power, even when they only occur occasionally. However, overemphasizing frequencies in this range will result in a muddy mix. Bass (60 Hz to 250 Hz). Because this range contains the fundamental notes of the rhythm section, any EQ changes will affect the balance of your mix, making it fat or thin. Too much emphasis will make for a boomy mix. High Mids (2 kHz to 4 kHz). The attack portion of percussive and rhythm instruments occurs in this range. High mids are also responsible for the projection of midrange instruments. Presence (4 kHz to 6 kHz). This frequency range is partly responsible for the clarity of a mix and provides a measure of control over the perception of distance. If you boost this frequency range, the mix will be perceived as closer to the listener. Attenuating around 5 kHz will make the mix sound further away but also more transparent. Brilliance (6 kHz to 16 kHz). While this range controls the brilliance and clarity of your mix, boosting it too much can cause some clipping, so keep an eye on your main meter. In the “Making the Cut” section are some general frequency principles to guide you through the wonderful world of equalization but these are far from set in stone. So how do you find the best and worst each instrument has to offer and adjust them accordingly? First, solo just the instrument with which you are working. Most engineers start building their mix with the drums and work from the bottom up (kick, snare, toms, high hat, overheads). Each instrument resonates the most in a specific frequency bandwidth, so if you are working on your kick drum mic, start with the lowest band of the EQ. Tune in the best-sounding low end and move on to the attack. It is not uncommon to hear an annoying ringing or a ‘“twang’” somewhere mixed in with your amazing-sounding low end and perfect attack, so your next task will be to find that offending frequency and notch it out. Once you are satisfied with your kick drum, mute it, and move on to the next instrument. Taking your time with equalization is well worth the effort. Your mix will have better separation and more clarity when each instrument’s EQ is set so that it shines through the mix. You can only do so much. Not every instrument can or should have a full, rich low end and a sharp attack. If every instrument is EQ’d to have the same effect, it will lose its identity in the mix. Your goal is not individual perfection, it is collective perfection in the mix. Step away from the mix. Your ears get fatigued just like the rest of you. If you are working particularly hard on one instrument, your ears will be quite literally numbed to that frequency range. Your memory is not what you think it is. Comparing a flat EQ and the curve that you’ve created allows you to see exactly what you’ve done. So be honest with yourself. Sometimes that EQ setting you’ve been working on for 15 minutes is not the right choice, so move on. Never be afraid to take a risk. 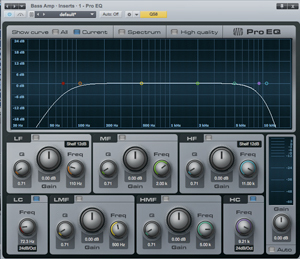 The best EQ tricks were found by mad scientists of sound. “Playing” applies to engineers as well as musicians. You can add clarity and fullness to any instrument in a mix by attenuating (cutting) or boosting certain frequencies. And of course, adjusting the wrong frequencies can make an instrument shrill, muddy, or just downright annoying. 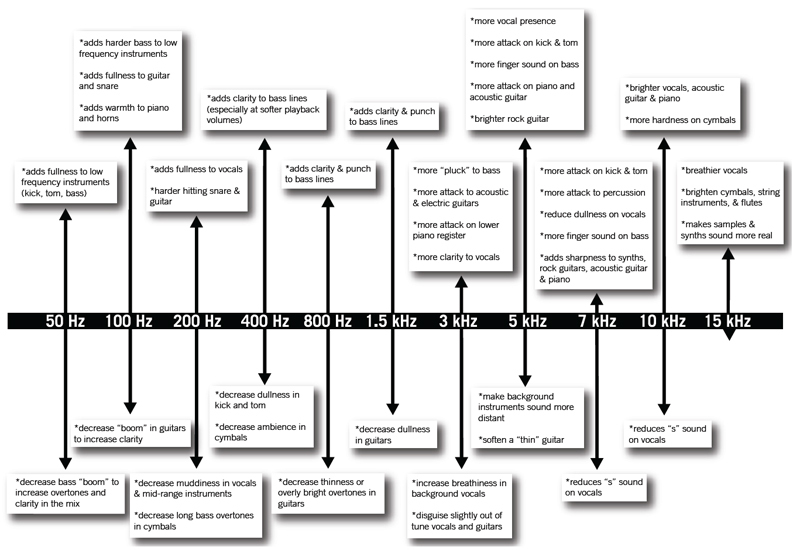 The following table offers suggestions for frequency ranges that should be boosted or cut when shaping the sound of commonly used instruments. Remember, these are just suggestions; these frequencies may need to be adjusted up or down depending on the instrument, room, and microphone. For more information about the effects of boosting and cutting various frequencies, see Fig. 4. FIG. 4: Here we see the general effects of boosting or cutting at various frequencies when equalizing several commonly used instruments. Here are suggested EQ settings for several different instruments to help you get started. These settings are for the four-band semi-parametric equalizers found in the PreSonus Studio Channel, Eureka, and StudioLive 16.4.2, but you can adapt them to other multiband semi-parametric EQs. If you are using a fully parametric EQ, such as the PreSonus Pro EQ plug-in, we suggest that you play with the Q setting when a high or a low Q is suggested, in order to find the right width for the instrument or mix. This will also give you a better understanding of how the Q affects the sound. Of course, the right EQ setting for any given instrument will depend upon the overall mix and the tonality of the instrument.